Grenache is one of the most widely planted red wine grapes on the planet, explaining its many synonyms: garnacha, garnaxta, alicante, nieddu, cannonau, lladoner and uva di spagna among them. This early budder / late ripener is a heat seeking missile, with sturdy wood, a penchant for dry, rocky soils, and upright growth pattern making it suitable for hot, arid climates, and able to withstand periods of drought. Thin-skinned and lighter fleshed, this sugar-building grape tends toward wines higher in alcohol and lighter in colour, often desirable traits in a blending partner, and why grenache isn't all that common solo. Often you’ll see it as a building block in a blend, as with Châteauneuf-du-Pape, or GSM. Red fruit are hallmarks, led by raspberry, strawberry and cherry, seasoned a characteristic white pepper, spice and dried herb savouriness, and tending towards a welcome leather and tar with age. Grenache’s versatility also makes it a feature player in rosé (Tavel, Navarra are prime examples) as well as the prized vins doux naturels of Roussillon, such as Banyuls. I don't usually pay attention to these things, but Sepember 21 is claimed as International #GrenacheDay, when I understand that "Grenachistas" around the world geek out on grenache. It certainly is the case for me this year, my last afternoon in South Africa, and attending a tasting of international grenache held in the Swartland before commencing my lengthy journey home. The photo above was taken by Samantha Suddons, of Smiley, Silwervis, and Terracura wines, and shows a small fraction of the international grenache we enjoyed. 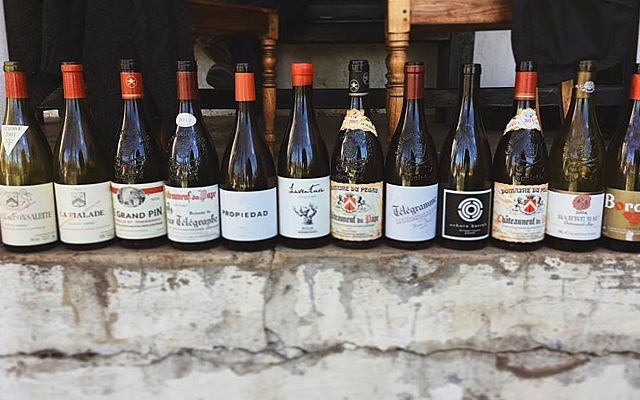 While wines tasted this trip to SAF are still to be entered, here are a few of our favourite grenache and blends tasted at GOW over the past few months.